Peacefully at Maitland Manor in Goderich on Friday, March 30th, 2018. Cynthia, in her 94th year. Beloved wife of the late Donald Larmouth. Loving mother of Ellen (late Robert) Fyfe and of John Larmouth (Karen Kennedy). Dear grandmother of Todd, Dean, Margaret and Shane and great-grandmother of Emma, Alistair and Rosie. Sister of Alan Griffiths of Etobicoke, Sylvia Hansen of California and the late Roy Griffiths. 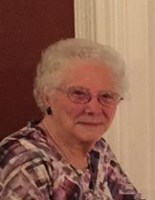 Donations in memory of Cynthia to ‘IODE Maple Leaf Chapter Goderich’ would be appreciated. Cremation arrangements entrusted to McINTOSH-ANDERSON-KELLAM FUNERAL HOME LTD., 152 King St. E., Oshawa (905-433-5558). Our sincere condolence to you on the passing of your mother. Cherish the many memories and hold them close to your heart.